This stereo FM wireless microphone also makes a great quality audio link. We tested it to beyond 50 meters and it was rock solid. It’s certainly not the first wireless microphone we’ve ever published but this one is a little different. It’s stereo, providing surprisingly good quality sound. Second, it has a really good range. We tested it at well over 50m and it was still performing very well – noise-free, in fact – but at the time we couldn’t get our receiver any further away. So it’s likely to have even better range than that. It's easy to build, requires very little setup... and it's cheap! In fact, the low price might turn some people off, thinking it's low quality. Try it - and be pleasantly surprised! 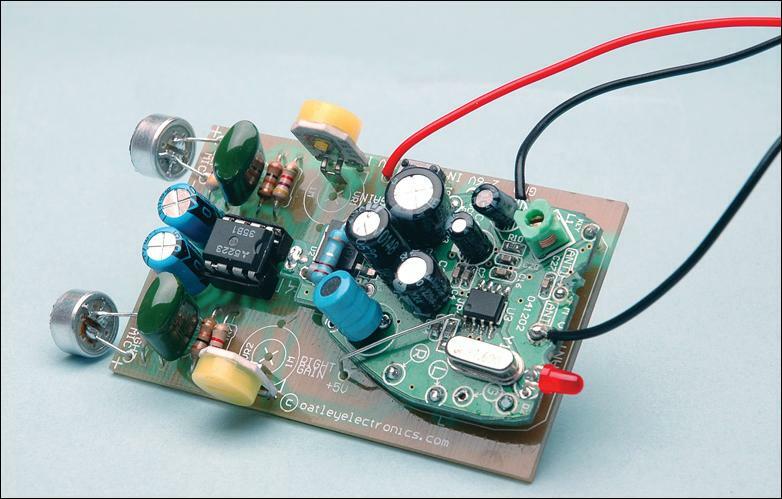 Third, it really is simple to build – the hard work (the transmitter module) is already done for you. 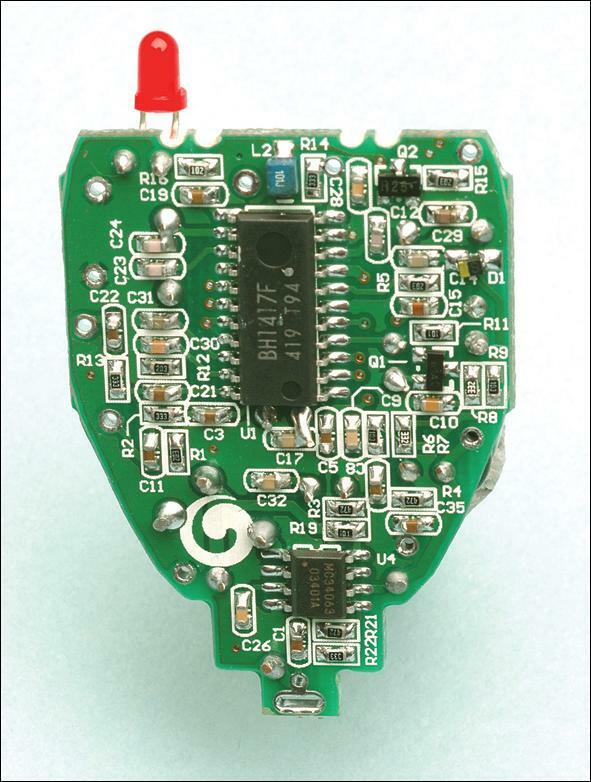 It’s just a matter of assembling the microphone module, which contains the electret mics themselves, preamp and level controls, and soldering the transmitter module onto it, "piggy back" style. Finally, the transmitter module is crystal-locked, so you won’t have the drift probles of some earlier wireless microphones. 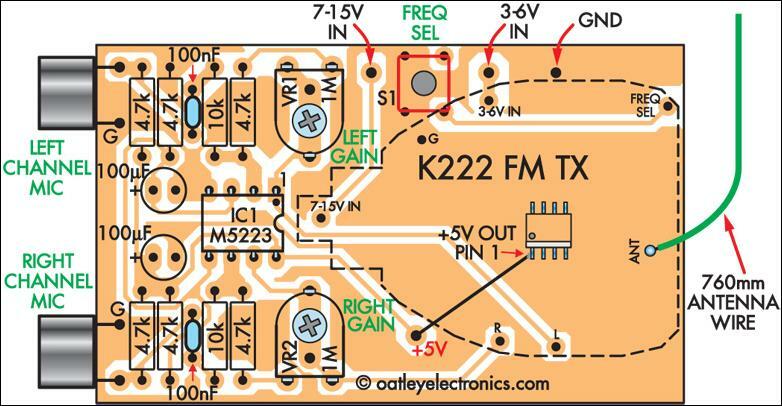 And just in case you were wondering, that doesn’t mean the output is locked to one particular frequency – it has a nifty synthesis circuit built in to give you the choice of seven different frequencies between 106.7MHz and 107.7MHz. On-board preset pots adjust the sensitivity of each channel to take into account mic differences or if you require different levels in each channel. By the way, the transmitter module is quite capable of operating at line level if you want just a line level transmitter (eg, to feed an audio program around your home). Sensitivity is about 100mV. 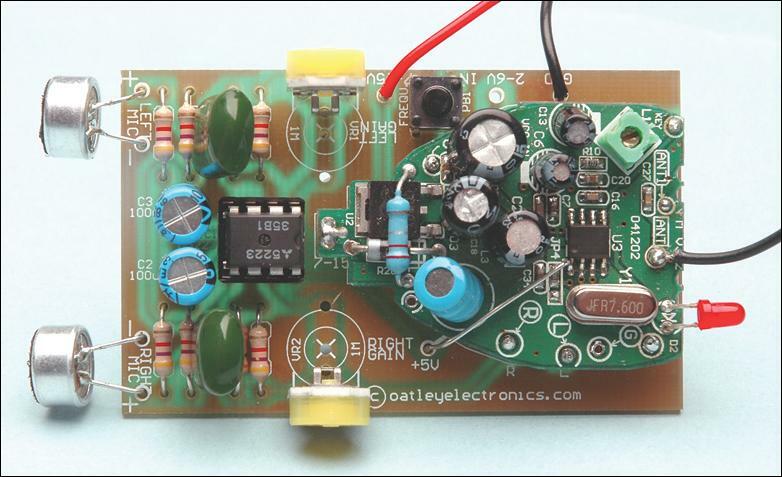 Oatley Electronics, who designed the kit, have the transmitter module available by itself if that’s what you’re after. But more on that anon. 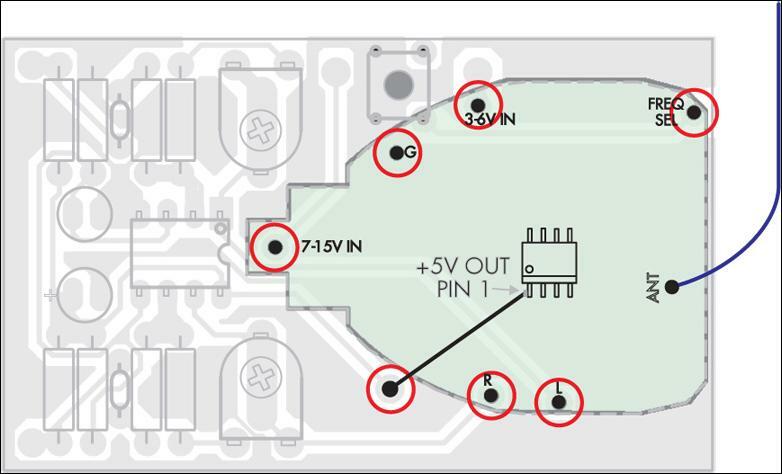 You also have the choice of two power supply levels – 3-6V or 7-15V DC. The latter results in a lower current drain. 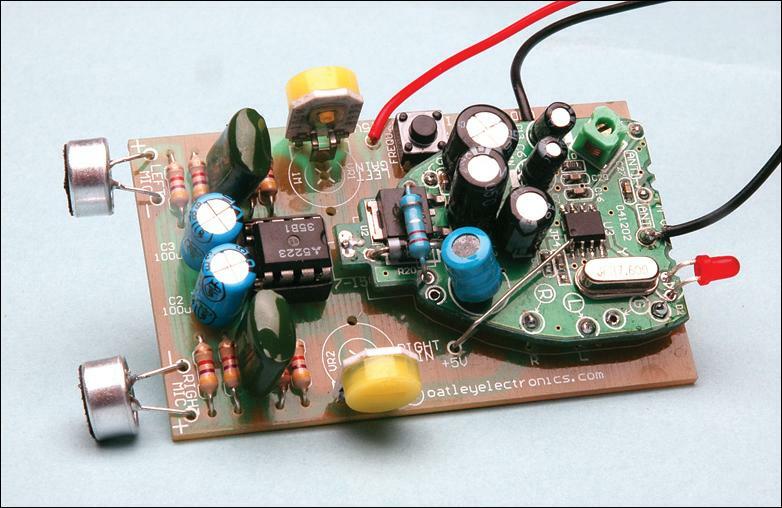 The transmitter module also has a "5V out" rail to supply power to the preamp module. 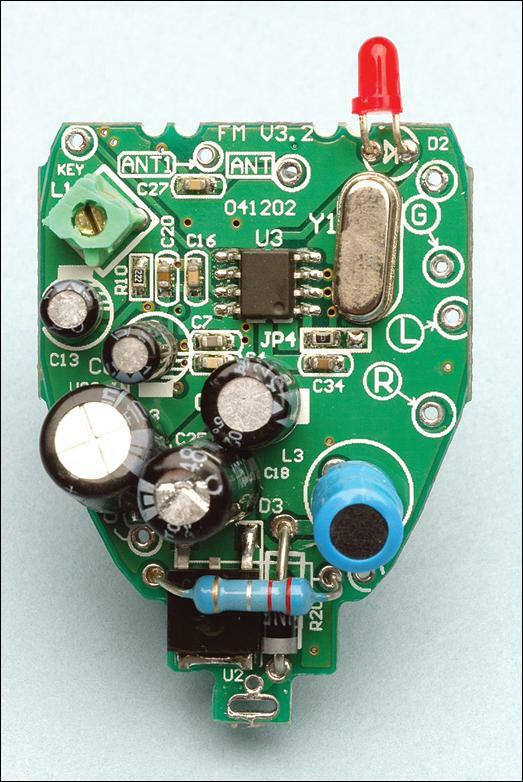 Two electret microphone inserts are supplied in the kit. These can be soldered direct to the PC board to make it a fully self-contained project or they can be attached to the board via suitable lengths of mini shielded coax cable. A third option is to use "proper" microphones – they can be electret or dynamic types – but no provision has been made for plugging these in.